Arctic News: Blue Ocean Event September 2017? Blue Ocean Event September 2017? Will there be a Blue Ocean Event in September 2017, during which the Arctic Ocean will be virtually ice-free? What would be the significance of such an event? The Arctic Ocean is about to become virtually ice-free, perhaps as early as next year. At first, this Blue Ocean Event may last for one or more days in September 2017. 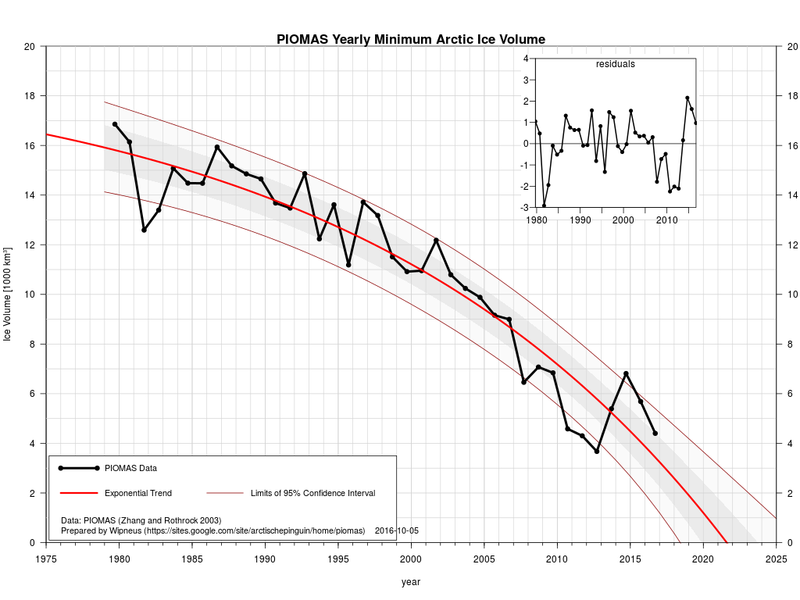 Over the years, the ice-free period will grow longer and longer, if no action is taken. Projections of an ice-free Arctic Ocean have been made for years. What makes the prospect of a Blue Ocean Event so dire? Disappearance of the sea ice means that a huge amount of sunlight that was previously reflected back into space, is instead getting absorbed by the Arctic. The reason for this is that sea ice is more reflective than the water of the Arctic Ocean. The situation on land in the Arctic is similar, i.e. the snow and ice cover on land is more reflective than the darker soil and rocks that get uncovered as the snow and ice disappears. So, extra heat gets added and this is accelerating warming in the Arctic. 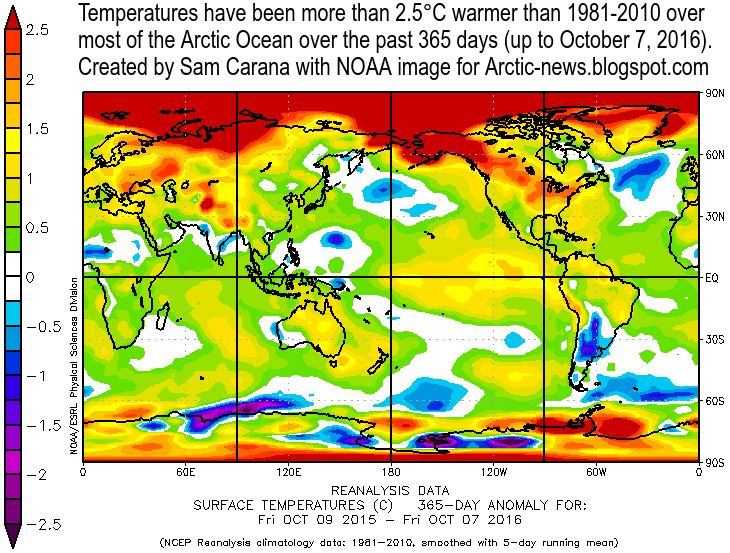 On land, extra heat will also warm up water of rivers, and a lot of this heat will end up in the Arctic Ocean. Another feedback is water vapor, as highlighted in the diagram below. A warmer atmosphere carries more water vapor. Since water vapor is a potent greenhouse gas, this further accelerates warming over the Arctic. As above image shows, temperatures have been more than 2.5°C warmer than 1981-2010 over most of the Arctic Ocean over the past 365 days (up to October 7, 2016). Accelerated Arctic warming has been taking place for a long time. So, what is it that makes a Blue Ocean Event, a virtually ice-free Arctic Ocean, such a big thing? It is a huge event, because once the sea ice is gone, warming of the Arctic Ocean is likely to speed up even more dramatically. Why? Because having no more sea ice means that the buffer is gone. In the past, thick sea ice extended meters below the sea surface, in many parts of the Arctic Ocean. Melting of this ice into water did consume massive amounts of ocean heat. As such, thick sea ice acted as a buffer. Over the years, Arctic sea ice has become thinner and thinner, as illustrated by the image below. Over the past few years, trends have been pointing at zero thickness soon, i.e. in a matter of years. Added below is a trend produced by Arctische Pinguin, pointing at zero volume sea ice in the year 2021. Note that there is some variability from year to year. This indicates that a Blue Ocean Event may well happen earlier than the trend, e.g. in September 2017. The image further shows that there's hardly any buffer left, the buffer is virtually gone! This buffer used to consume massive amounts of ocean heat that is carried along sea currents into the Arctic Ocean. 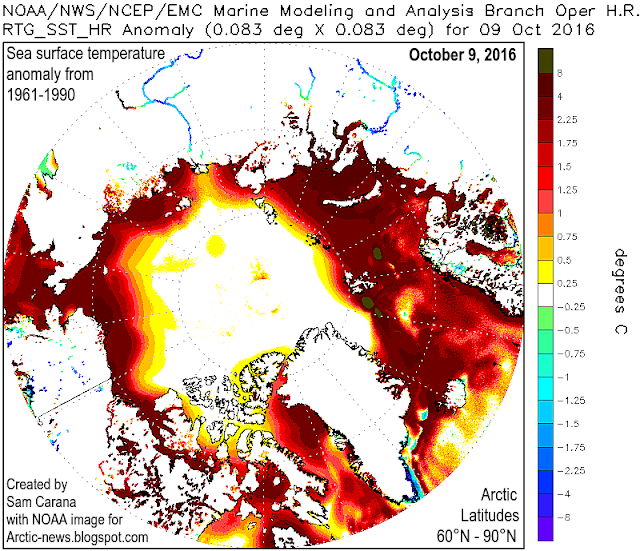 Once the sea ice is gone, that heat must go somewhere else. A huge amount of energy used to be absorbed by this buffer, i.e. by melting ice and transforming it into water. The energy that used to be absorbed by melting ice is as much as it takes to warm up an equivalent mass of water from zero °C to 80 °C. Much of this heat will then suddenly speed up warming of the water of the Arctic Ocean, rather than going into melting the ice as it did previously. So, the water of the Arctic Ocean will suddenly warm up dramatically. Remember that the Arctic Ocean in many areas is very shallow, in many places it's less than 50 m deep, as discussed in an earlier post. 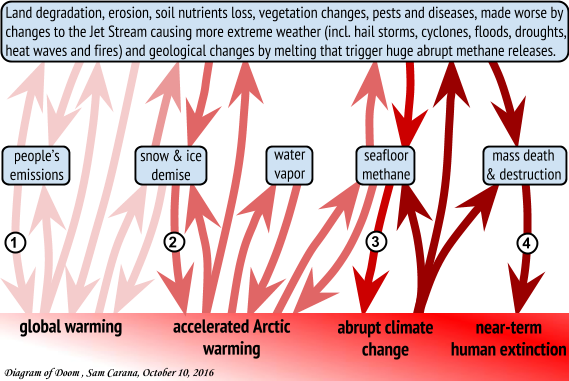 The danger is that this extra heat will reach the seafloor and destabilize methane hydrates that are contained in sediments at the bottom of the Arctic Ocean. This could result in huge methane eruptions. It is hard for methane plumes to get broken down in the water, given the abrupt and concentrated nature of such releases and given that the Arctic Ocean is in so many places very shallow. Once that methane enters the atmosphere, it will strongly contribute to further warming of the atmosphere over the Arctic. In conclusion, disappearance of the sea ice would mean that the buffer has gone. This further increases the danger of huge abrupt releases of methane from the seafloor of the Arctic Ocean. In many respects, the danger is such that we can just count ourselves lucky that such huge releases haven't occurred yet. In response to this danger, comprehensive and effective action is needed, along multiple lines of action, each implemented in parallel and simultaneously. While local feebates are typically the most effective policies, local communities can each decide what works best for them, provided that agreed targets are met, and such targets will need to be a lot stronger and more comprehensive than the aspirational emission reductions that countries have submitted as part of the Paris Agreement. Link is included at the Extinction page to earlier discussion at Arctic news group. In that same paragraph at the extinction page (under: Rise due to carbon dioxide from 2016 to 2026), there's also a link to an earlier post describing the danger of extreme weather events further accelerating warming. the methane, as soon as it gets into the atmosphere, begins to seek equilibrium in the atmosphere, the thickness of the atmosphere near the Arctic is rather shallow as compared to lower latitudes near the horse latitudes on down to the equator, that is where the methane is going, take a moment and look up noctilucent clouds storm on you tube, that video, as well as hundreds of others like it posted this past summer is a representation of where the methane is going. We are in the beginning moments of a new era in human evolution.